Girls with her family visit and tour in Tanah Lot, Tabanan, Bali. They come together to relax and enjoy the beauty of the beach with beautiful rock clusters. Playing on the beach during high tides. 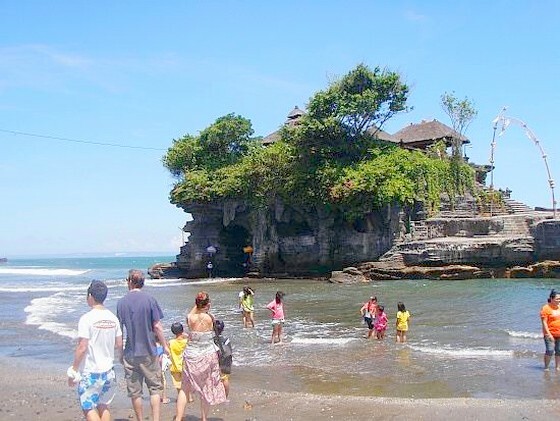 Tanah Lot Tabanan Bali always be excellent and the most preferred by each family. Not only to see the view of the sea and beaches, as well as to enjoy a very pleasant atmosphere accompanied by bright sunshine. Tanah Lot is a great place to vacation with family. At dusk, Tanah Lot Tabanan Bali will be very crowded by tourists and local residents. They come to enjoy the beauty of the sunset with the wind blows from curved. The waves are getting smaller at night. Evening atmosphere make it more soothing the soul. Tanah Lot Tabanan Bali is the best place to enjoy the atmosphere of twilight filled with beauty. Sitting among the rocks at low tide. Staring at sunset with reddish light. Dark wait until nightfall. If you go to Tanah Lot, should come before sunset. Because the beauty of Tanah Lot Bali will be fun when viewing the sunset with family. Choosing a good place is a very appropriate decision. The best place to see the sunset in Bali, and Tanah Lot is the best choice to watch the sunset. 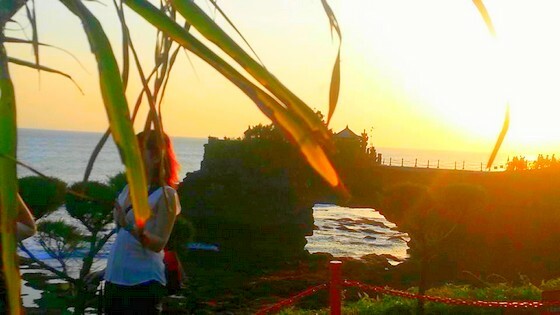 With family or with the beloved while watching the sunset at Tanah Lot is the perfect decision. Because with a lover or family, will further strengthen the relationship and love our partner. Because the atmosphere of twilight at sunset in Tanah Lot Bali will be very difficult to be forgotten by anyone. The magnificent beauty, is in place famous up to foreign countries, Tanah Lot Bali Bali is an icon for tourism, has also become an icon for Indonesian tourism. Warning, while in Tanah Lot Tabanan Bali, should remain cautious. Tanah Lot Bali adlah sights most causes of death. The beauty of the temple and the rock can make people forget the dangers that exist around this place. Sea waves look very beautiful has caused the death of many people. Many foreign tourists who died in Tanah Lot Bali because not careful with the surrounding conditions.